This Los Angeles weather really takes some getting used to. Despite the promise/threat of a Godzilla El Nino, we have in fact had 2 days of good rain, a few short periods of English drizzle, and plenty of sunshine so far this winter. Yesterday was not only sunny, but also warm. Almost summertime warm. We’re talking 73 degrees (that’s about 23 degrees celsius). These strange meteorological patterns make it very difficult to decide what to eat in the morning. 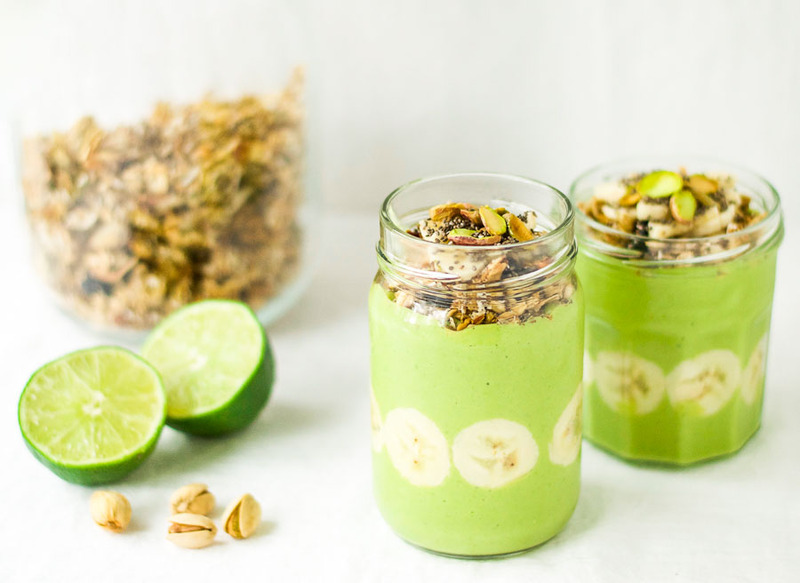 Should I have comforting coconut oatmeal or a refreshing tropical smoothie? This morning, the smoothie won. This mint, lime, and ginger tropical smoothie to be precise. This smoothie is a blend of tropical summertime flavors with immune boosting winter ingredients. It has mango, pineapple, banana, lime, and mint to give a fresh, summery taste. But lurking beneath those flavors are the immune-boosting probiotics from the kefir and the anti-inflammatory compounds from the ginger. It also contains spinach for added nutrients, and avocado for some healthy fat. You can daydream about holidays in Hawaii, while helping your body fight away the nasty winter viruses that seem to be making the rounds. 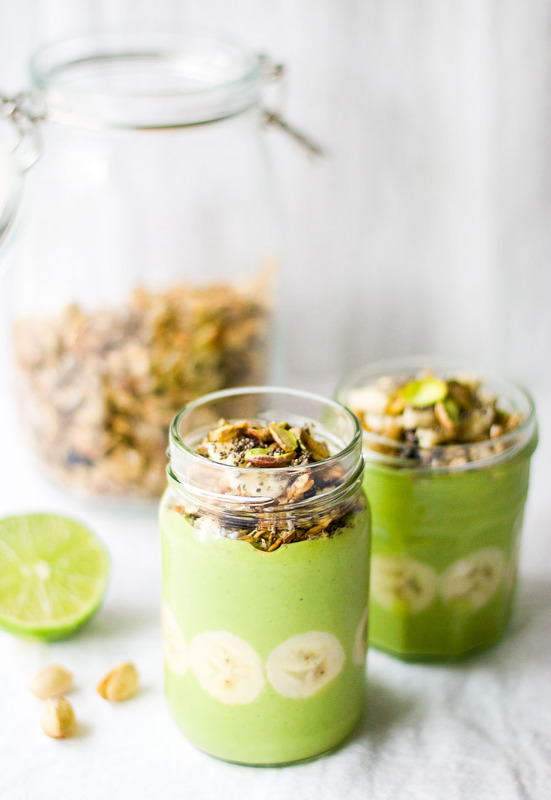 I topped my mint, lime, and ginger tropical smoothie with homemade granola, sliced banana, pistachios for crunch, and chia seeds for some added omega-3 goodness. But you could top yours with anything your heart desires. 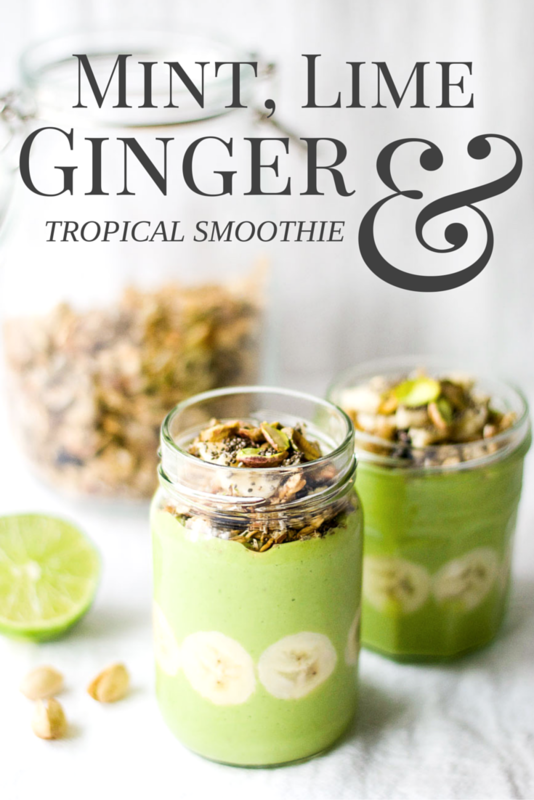 A mint, lime, and ginger smoothie with mango, pineapple, banana, and kefir. Top with granola, nuts, or fresh fruit. 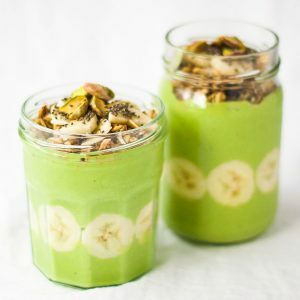 What a unique and tasty smoothie! Healthy too. Thanks Chris. As I was putting the ingredients in I was a little skeptical, but it ended up being my favorite smoothie of 2016 so far. The mint and lime combo made it really refreshing, and there was just a slight hint of ginger. I just tried this recipe and LOVE it! So refreshing. Also that photo is the prettiest smoothie photo I’ve ever seen. Also, where the heck is our El Nino rain? I bought my daughter galoshes and an umbrella because they made it sound like it would be the rainiest winter ever, and we’ve used them once so far!